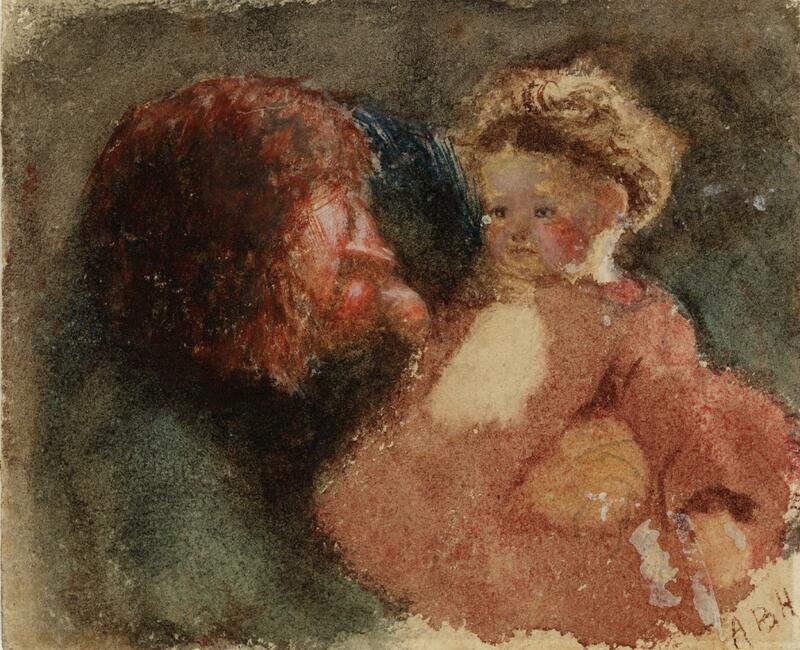 Head of a Woman and Child, by Arthur Boyd Houghton (1836-1875). Watercolour on paper. Support: 79 x 95 mm. Collection: Tate Gallery. Presented by Miss Frances Burlison through the Art Fund 1928. Reference: N04403. Image kindly released by the gallery under the Creative Commons CC-BY-NC-ND (3.0 Unported) license. This affectionate portrait of a mother and child might be of Houghton's own wife and daughter. He has caught the pose of the mother, her arms round the child and her face inclined towards her, so perfectly — and the child, who seems to need comforting, looks ahead, a little sadly, into the near distance. The mother may look as intently as she lies, but her child's thoughts are already her own and they cannot yet be framed in words. In its soft colours and unfinished suggestiveness, this is a touching, and haunting, picture. — Jacqueline Banerjee.